Volcanoes are clearly a hazard when they erupt explosively, but they are also portals to the deep melting regions in the mantle. We study both aspects of volcanism. Our work on volatiles links to eruption, and diffusion profiles clock magma ascent prior to eruption. Our work on volatile inventories and magma ascent leads to a new understanding of why some volcanoes are more explosive and erupt more frequently than others. Current projects focus on Kilauea and Central America. Mafic magmatism is also a direct product of mantle melting, and we continue to read the melting record stored in volcanic rocks and their crystals. Current work focuses on melting regions driven by continental extension (Basin and Range and Papua New Guinea) and water addition (subduction zones). The process of cratonic lithosphere deformation remains mysterious. The Colorado Plateau (CP), including its underlying lithosphere, has persisted for over a 1Ga, while in parts of the adjacent Basin and Range (B&R) Cenozoic extension has thinned the lithosphere by half. Today, extensional processes are focused in the transition zone between these two regions, which is defined by a region of volcanism and active faulting. We combine seismic tomography models from EarthScope data with melt thermobarometry from mafic scoria erupted in three volcanic fields since 100ka to investigate lithospheric deformation in this actively rifting area. Our sample locations lie along the western and southwestern margin of the CP and record different evolutionary stages in the process of lithosphere destruction via melt infiltration. For each volcanic area studied we use seismic profiles of shear wave velocities (Vs) with pressures and temperatures of mantle-melt equilibrium calculated using the Si and Mg thermobarometer (Lee et al 2009). The thermobarometric results depend highly on the water and Fe3+ content of the melts, which were constrained separately for each volcanic field. Magmatic water contents have been determined by ion-microprobe measurements of olivine hosted melt inclusions. Fe/ΣFe+3 ratios were estimated for each volcanic field via LA-ICP-MS analysis of V in olivine and whole rock compositions (Canil 2002). In the northernmost volcanic field, Black Rock (BRVF), Utah, melts are hot (consistent with mantle potential temperature (Tp) >1400°C), dry (≤1 wt% H2O), and have equilibrated at shallow depths (<70 km), within the seismic lid. Shear velocities in this lid, however, are anomalously slow (4.1 km/s), and the mantle beneath (Vs ~ 3.9 km/s), is the slowest in the B&R, coincident with the highest and most focused extension rates (Wasatch Fault Zone). Together, these observations support high mantle temperatures, inefficient melt extraction, and a weak lithosphere due to melt corrosion, which has focused strain. Further south, in Snow Canyon Volcanic Field, Vs in the low-velocity zone and seismic lid are faster than at BRVF and magmas record equilibration depths that coincide with the seismically defined lithosphere-asthenosphere boundary (~70km). 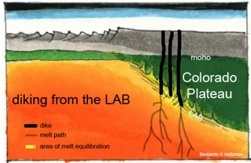 In this location both observations are consistent with a stronger lithosphere, which may allow rapid melt ascent by diking from the LAB to the surface, and limited melt-infiltration. Lavas from the most southern volcanic field, the Grand Canyon, record the deepest and largest range of melt equilibration depths (49-139km), the highest water contents (up to 3wt%) and have the most variable geochemistry (Nb/La ranging from asthenospheric to lithospheric values). Several vents contain abundant mantle xenoliths. Mantle Vs here is consistently higher (>4.1 km/s) than all the regions to the north. Here, lower mantle Tp, a stronger lithosphere, and wetter melts appears to enable more efficient melt extraction from all depths. Our results indicate that the destruction of the CP lithosphere occurs via a spectrum of processes along its margin, ranging from diking in the south to extensive melt infiltration and corrosion in the north. The spatial distribution of mantle heat and water content may exert a primary influence on the mode of lithosphere destruction, surface strain and volcanism. The size and intensity of volcanic eruptions is controlled by a combination of the physical properties of magmas and the conditions of magma ascent. At basaltic volcanoes, where relatively fluid magmas are erupted, sustained explosive eruptions vary widely in style, from Hawaiian fountains erupted 10s to 100s of meter high to large Plinian type events, involving >20 km high eruption plumes. 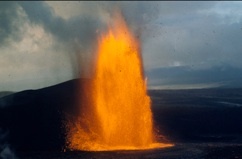 Decompression of magmas leads to volatile saturation and bubble growth, however it remains disputed how the dynamics of shallow ascent and degassing might control this disparate eruptive behaviour, or whether factors such as the initial volatile content exert the primary control on eruption style. A key issue is that the physical conditions of magma ascent, which may significantly impact eruptive dynamics, remain largely unconstrained by observational data. Here we quantify two primary variables - decompression rates and volatile contents - for magmas from three contrasting eruptions of Kīlauea volcano, Hawaii, using microanalysis and modelling of volatile diffusion along small melt tubes or embayments found in olivine crystals carried by the ascending magmas. During ascent decreasing solubility causes dissolved volatiles to diffuse along the embayment towards growing bubbles at the crystal edge. By modelling the diffusion of H2O, CO2 and S we obtain decompression rates, and indirectly ascent velocities, for the rising magma. For Hawaiian style fountaining events we obtain ascent rates of 0.05-0.07 MPa s-1 (~1 m s-1), whereas for a more intense subplinian eruption we obtain a notably faster rate of 0.29 MPa s-1 (>10m s-1). 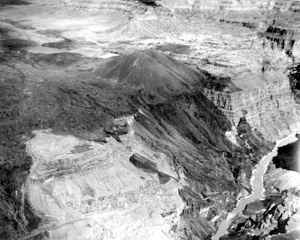 The timescales of melt transport from the storage region during these eruptions varied from around 3 to 40 minutes. We find no link between pre-eruptive volatile contents and eruption intensity, rather our results suggest that the eventual size of sustained explosive basaltic eruptions is likely governed by factors affecting the ascent velocity of melts in the volcanic conduit. The observed decompression rates are consistent with measured discharge rates, and with models predicting greater magma chamber overpressure for larger eruptions. Ascent rates may also further modulate dynamic processes in the volcanic conduit, such as the flow regime and bubble expansion, and consequently eruptive intensity. Geochemistry, Geophysical, Geosystems (2012) 13 doi:10.1029/2012GC004060. 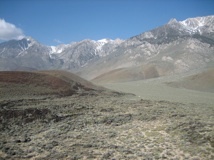 Here we report the first measurements of the H2O content of magmas and mantle xenoliths from the Big Pine Volcanic Field (BPVF) in order to constrain the melting process in the mantle, and the role of asthenospheric and lithospheric sources in this westernmost region of the Basin and Range Province, western USA. Melt inclusions trapped in primitive olivines (Fo82-90) record surprisingly high H2O contents (1.5 to 3.0 wt.%). while lithospheric mantle xenoliths record low H2O concentrations (whole rock <75 ppm). Estimates of the oxidation state of BPVF magmas, based on V partitioning in olivine, are also high (FMQ +1.0 to +1.5). Pressures and temperatures of equilibration of the BPVF melts indicate a shift over time, from higher melting temperatures (~1320 °C) and pressures (~2 GPa) for magmas that are >500 ka, to cooler (~1220 °C) and shallower melting (~1 GPa) conditions in younger magmas. The estimated depth of melting correlates strongly with some trace element ratios in the magmas (e.g., Ce/Pb), with deeper melts having values closer to upper mantle asthenosphere values, and shallower melts having values more typical of subduction zone magmas. This geochemical stratification is consistent with seismic observations of a shallow lithosphere-asthenosphere boundary (~55 km depth). Combined trace element and cryoscopic melting models yield self-consistent estimates for the degree of melting (~5%) and source H2O concentration (~1000 ppm). We suggest two possible geodynamic models to explain small-scale convection necessary for magma generation. The first is related to the Isabella seismic anomaly, either a remnant of the Farallon Plate or foundered lithosphere. The second scenario is related to slow extension of the lithosphere. Convergent margin volcanism is ultimately fed by magmas generated in the mantle, but the connection between the mantle and the eruption at the surface is typically obscured by cooling, crystallisation and magma mixing within the crust1,2,3. Geophysical techniques are also challenged in the lower and middle crust, where seismic events are rare and resolution is generally poor4,5. It has thus been unclear how fast mantle-derived magmas transit the crust and recharge crustal magma chambers. 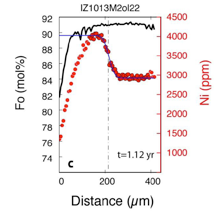 Here we use diffusion modeling of nickel zonation profiles in primitive olivines to show how mantle recharge may occur on timescales as short as eruptions themselves. In an example from Irazú volcano in Costa Rica, magmas apparently ascend from their source region in the mantle through ~ 35 km thick crust in months to years, recharging hybrid basaltic-andesites over the course of the eruption. Diverse olivine populations derive from distinct primary melts that mix on the same timescales. 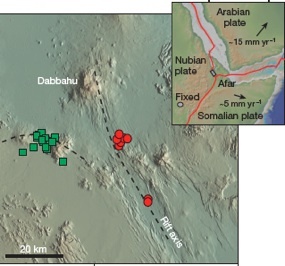 These results show that large stratovolcanoes with shallow magma chambers9,10 may still preserve the deep record of their mantle origin in olivine crystals. This is the first time that magma ascent timescales from the mantle have been documented beneath a convergent margin stratovolcano. This new approach can be applied to other eruptions that record magma mixing with recharge melts. Signs of volcanic unrest are typically monitored at the surface or upper crust; new efforts should set sights deeper, tracking magma movement from the base of the crust to the surface in the months to year run-up before eruptions.